The hat is out of the block. I used scissors to cut the edge following the string line. I like the downwards curve of the edge, which I believe works nicely with the general curviness of the hat. When I took that picture it still needed a good brush up, though. 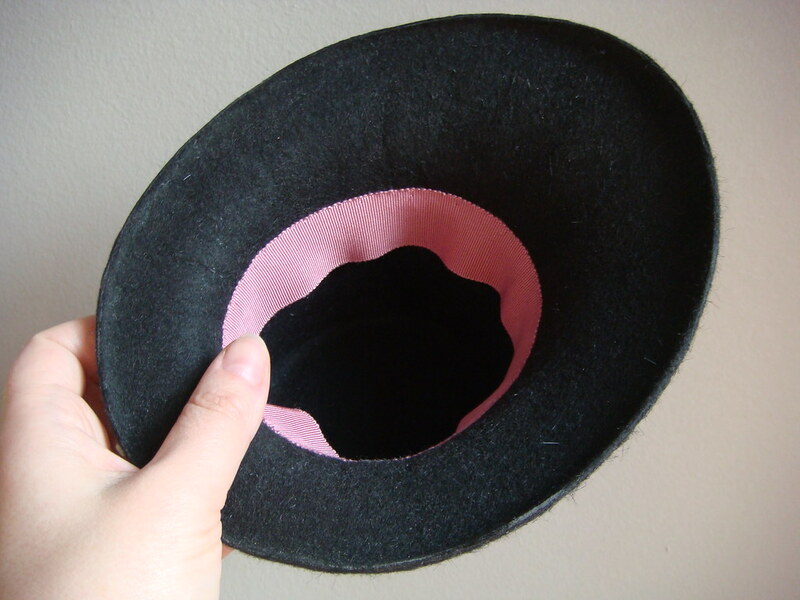 I’ve added chemical stiffener on the inside because the hat was too soft. 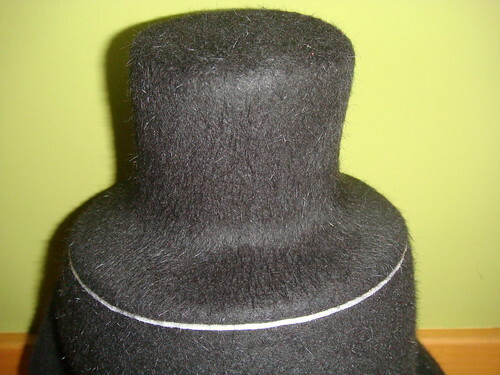 Below is a picture of the inside of the hat. Whereas on the outside you cannot see any wrinkles, on the inside and with the lateral light that is hitting the hat one can see some wrinkles around the “headsize”. The grosgrain has been sewn in place using pink thread, which cannot be seen on the outside because I go in with the needle on the same place I came out (but on a different angle). I’ve had to sand the edge a lot to get rid of irregularities which are my very own fault for doing a lousy job with the scissors. The edge also needs to be cleaned with a wet cloth to get rid of the white dust. These days I feel a need for simplicity and hang on to the old adage “less is more” (or more recently the KISS principle). I feel there are too many overloaded, heavy handed, unbalanced hats and fascinators on the market (with this tendency to add everything but a kitchen sink on the hat/fascinator), that I feel an urge to steer clear of that and to condemn it. The simpler the hat the more difficult it is to make. 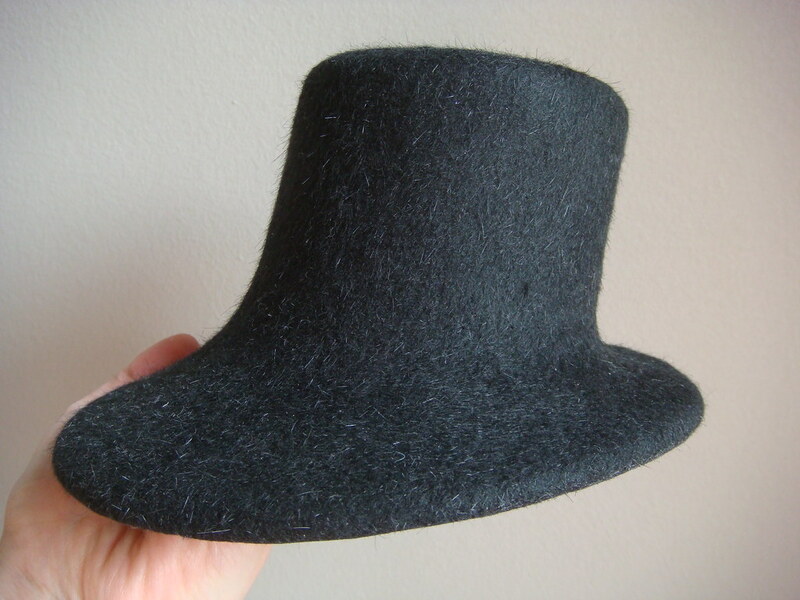 A simple elegant hat is a challenge (I’m not saying my hats are elegant or simple… but one does strive for that). Having said that, there are hats where there’s a lot going on (as an example, the wonderful butterfly hat by Philip Treacy) that work wonderfully (or so I think). I think making a complex hat look becoming and in a way “simple” is an even more difficult task. There, I said it. That’s what I think of the proliferation of fascinators in the market. I have nothing against the fascinator as long as it’s well made (no glue thank you) and it’s becoming. I also encourage the people that only make fascinators to branch out and learn more, because there’s so much more to learn and there is a lot of joy involved in becoming a milliner… and that is why I write this blog, to share what I know. 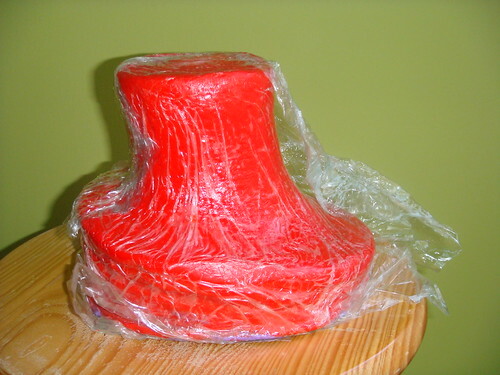 Those who have been following me for a while might remember that I did a mini plasticine (aka Play-Doh) hat block to use it for making straw braid hats (like these ones). I’ve been thinking for a while that this block would make a beautiful felt hat, but if I blocked felt on it, it would soon lose its shape, so today I set off to make a cork version of the block. The result is quite close to the original, but one must keep in mind that the curves of the original block where due in great measure to the fact that plasticine is very malleable and lends itself to that kind of look. 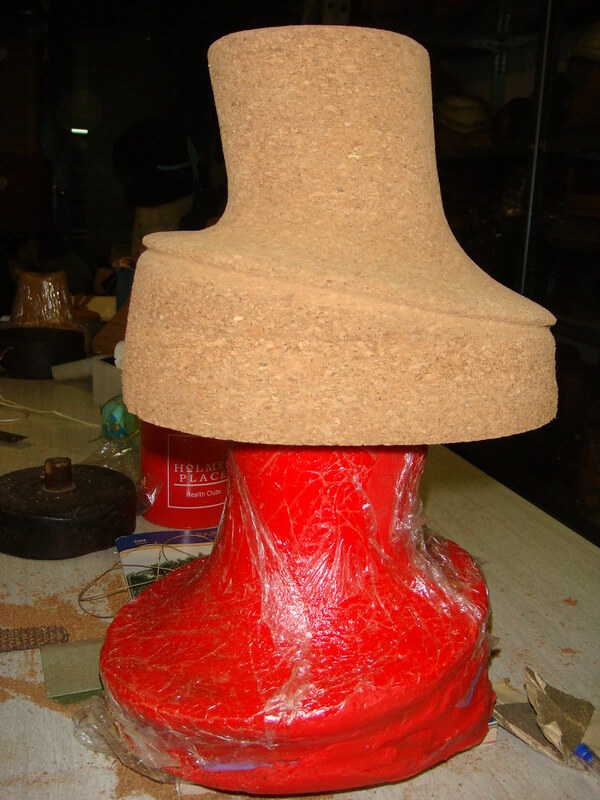 Reproducing that curviness with cork has been difficult. 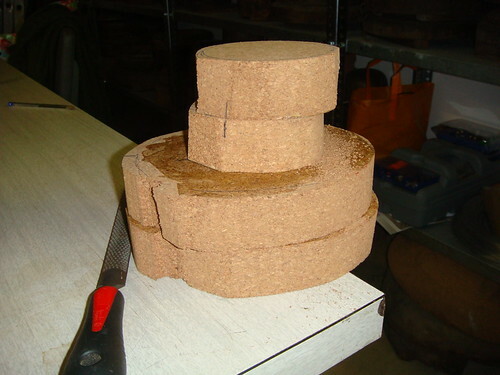 You can imagine how difficult it has been by looking at the pile of glued cork layers (4 centimeters each) that I started with. When I started I had my doubts it would work out, but I’m pleased that it did in the end, after hours of filing and sanding away. Now there’s only one thing left to do, to block a felt on it! This hat was a commission. 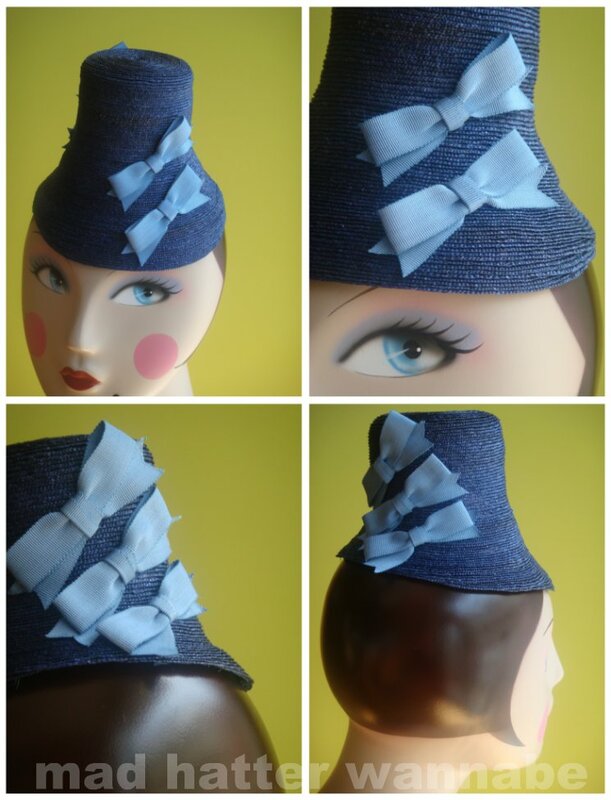 The lady who commissioned it needed a hat to go with a simple sleeveless blue silk cocktail gown for a wedding in the UK. The original idea was to use feathers, because I had biot feathers of the exact colour of the dress, but I was not happy at all with my attempts, and finally I changed directions completely and went with the bows you can see now (the grosgrain being also of the exact colour). I think the result is sweet and fun… what do you think? 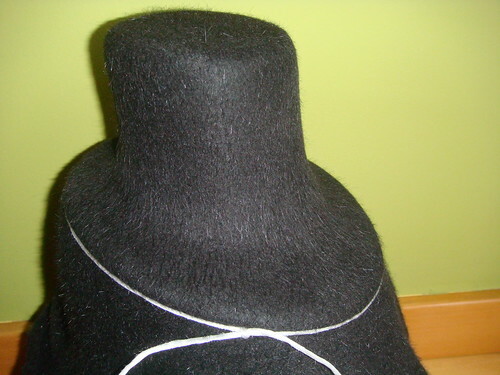 It’s finished on the inside with a grosgrain ribbon and an elastic band keeps the hat firmly in place. I hope you enjoy it! I’ve been trying to tame my straw braid sewing machine and here are the first results. I have used vintage straw braid from my personal stash. 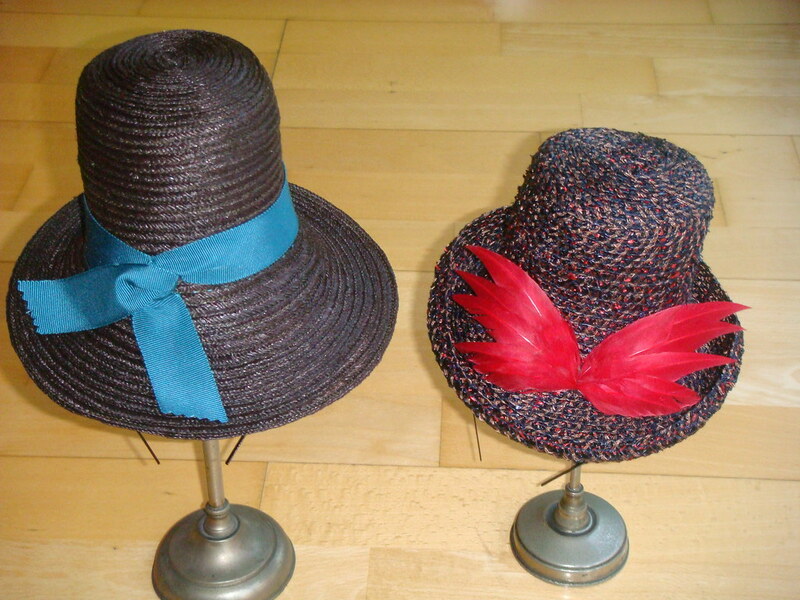 These two hats have been created using a block that I have made myself. 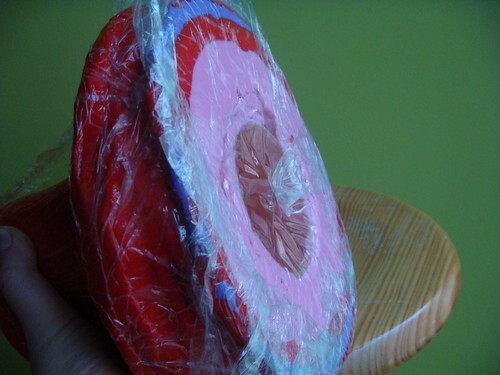 The block is made with Plastilina Jovi (a non hardening modelling clay similar to Play-Doh). I buy it in packs of 350 grams, and in this case I have used a long plastic container as a base to minimize the waste of material (and give it extra stability). Using a block is important when sewing straw as one goes back to it repeatedly, removing the hat from the machine and trying for fit, checking that the hat is adjusting to the block (and undoing rows of work when it’s too narrow or too wide). 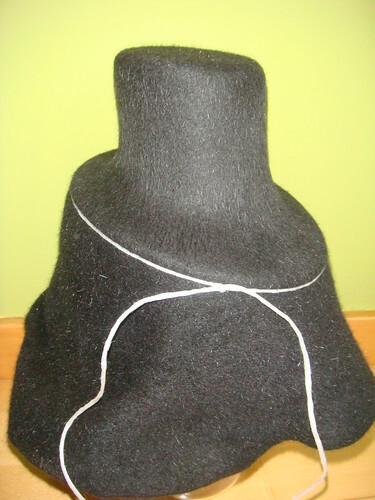 When the hat is finished the block allows us to iron the hat and stiffen it. My block has a serious drawback (but a design decision) and it’s that the distance between the center of the tip to the front edge is bigger than the distance to the back edge. That means that I have to add extra strips on the front (where the brim begins) to compensate for that. Adding those strips is a pain! As for the way to wear these small hats, I did try fitting an elastic band (which is the most comfortable way to wear these small hats and hides nicely under the hair) BUT the elastic pulled the sides of the hat apart (because it’s pretty soft) and deformed it. I used straw stiffener (before trimming) but for some reason it doesn’t stiffen the hat as much as I would want it too. 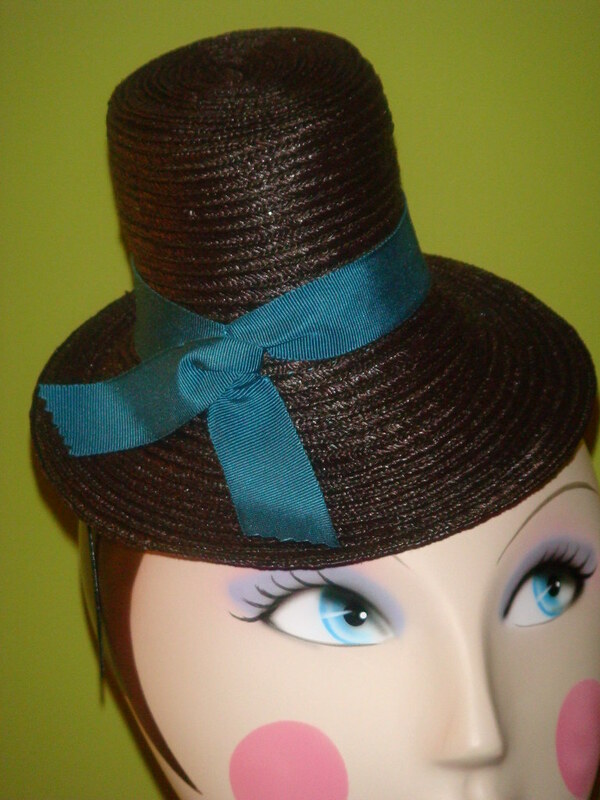 I had to think of another way of holding the hat on the head so I added a piece of elastic velvet ribbon, long ends sewn together to form a tube and then sewed the ends to the hat (being careful not to close the entry!). That allows me to thread a metallic headband, with the advantage that I can move the hat to position it and I can change the headbands colour to adapt it to the wearers hair. I will post some more on this subject soon. I want to share with you what I’ve worked hard to learn on my own, since (and it shouldn’t come as a surprise) there’s nothing written on the subject on the Internet or in print and many of those who know don’t feel like sharing. 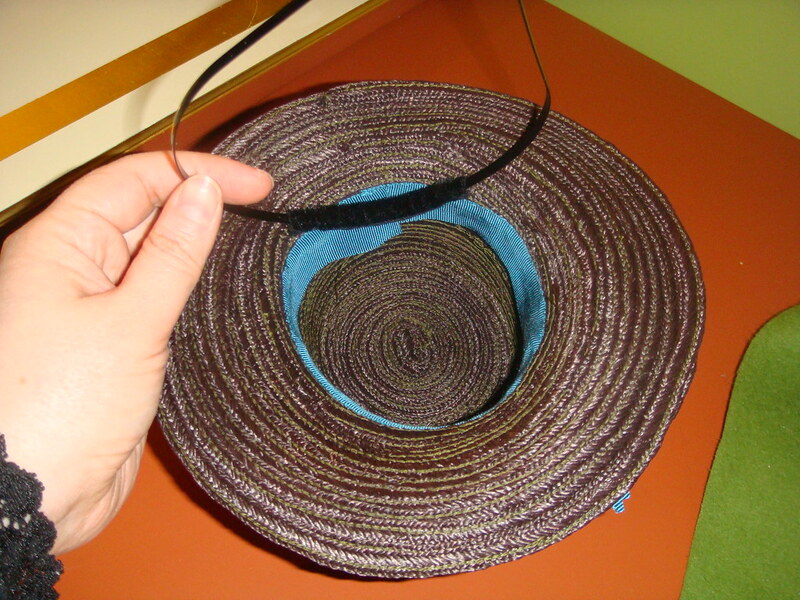 As an example, I recently had the opportunity to talk to a person who makes straw braid hats (father and grandfather also did so) and when I told her that I had problems when starting the hat because it tends to curl up too soon she said “yes… yes…”, turned around and went on her merry way. Nice. Be on the look out for more soon! All (that I know) will be revealed!